Every market day offers something new for everyone – be it herbs, seasonal vegetables & fruit, salsa, bread, bouquets, music or kids’ activities. In addition to your groceries, there is authentic artwork, crafts and gifts from the heart, as well as delicious scones, burritos and pastries to enjoy while you’re there. Grab a cup of coffee/tea, sit in our bistro, listen to the music and watch the fun all around. Greeley Farmers’ Market is the place to be Saturday mornings. Talk with your farmer, meet your neighbors, celebrate Weld’s bounty – Join Us! Come for the food, stay for the fun. 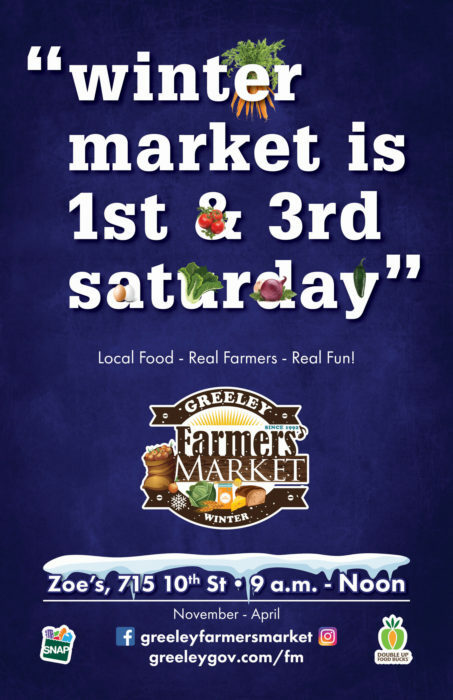 The Greeley Farmers’ Market is primarily for fresh food vendors, value-added food producers and arts/crafts related to the culinary arts. All food and products must be grown, raised or made in Colorado. Preference is given to vendors with products from Weld County, Colorado. Vendor selection is at the discretion of the Market Manager. Are you a local grower/food producer? We’re looking for cheese and mushroom vendors. Check out our vendor page﻿﻿ for details.